In amchi cuisine, we have varieties of dosa like panpolo, chanmbure polo, layi polo, pejje polo, mushti polo, etc. I have already posted the recipe of panpolo. Today will post the recipe of mushti polo. "Mushti" in konkani means fist and "polo" means dosa, so the name itself gives you an idea that this dosa is traditionally made measuring the ingredients with our fist in certain ratio with the quantity of rice. This is a soft, spongy, porous dosa with loads of holes resembling a honeycomb. The most commonest recipe to prepare them includes use of rice, urad dal, methi seeds, poha and grated coconut. 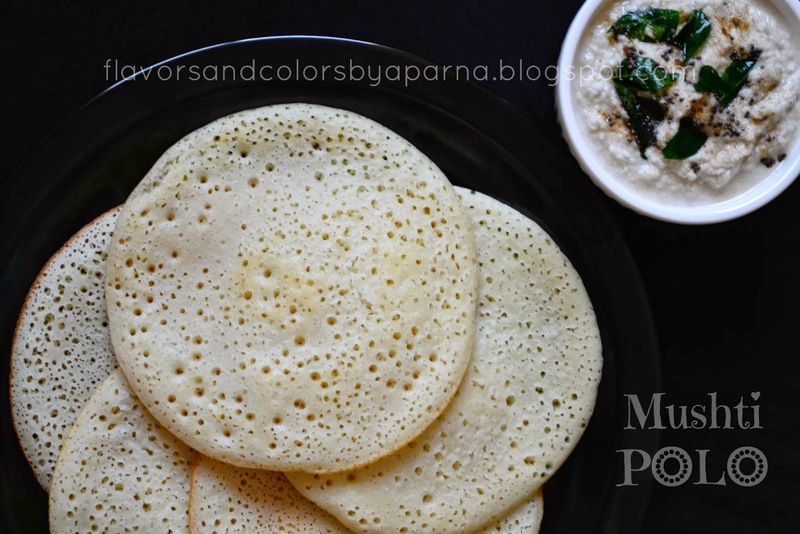 But for the healthier option we can exclude grated coconut and prepare similar soft porous dosas. 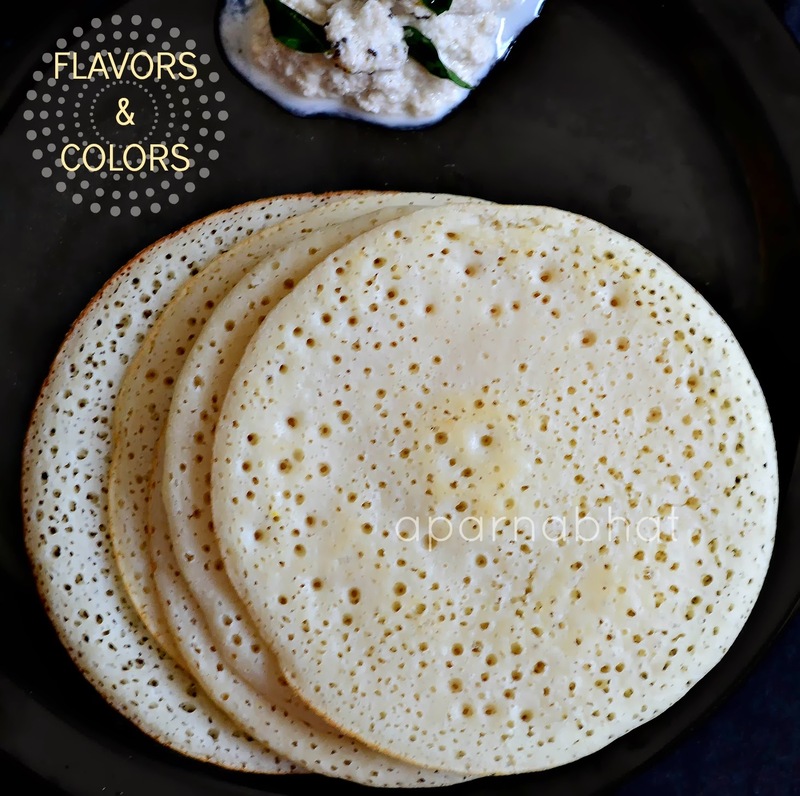 It is the grinding of the batter to an easy pour consistency and the fermentation process that will make these dosas perfect. Soak rice and urad dal after multiple wash. Add 1 tsp of fenugreek seeds in water and soak these ingredients for atleast 6 hrs. Wash and soak the poha just 15 mins before grinding. Before grinding drain the water and collect it in a vessel. Grind all the ingredients together using the above collected water [as required] into a smooth batter of pouring consistency. Pour the batter in a vessel which has enough room to allow the batter to rise. Add salt to taste, don't mix at this time, cover and keep it aside to ferment overnight. Next day morning, before you proceed to make the dosas, beat the batter. Heat a dosa griddle [ I usually use non-stick tawa]. Place half ladleful of the batter on a medium hot griddle and spread it lightly with the back of the ladle in circular motion. Remember this dosa is spongy hence don't spread it too much. Add few drops of oil on sides of the dosa [you may skip this oil if you use non stick tawa]. As you start seeing the holes appearing on the surface of dosa, cover it and cook till done. 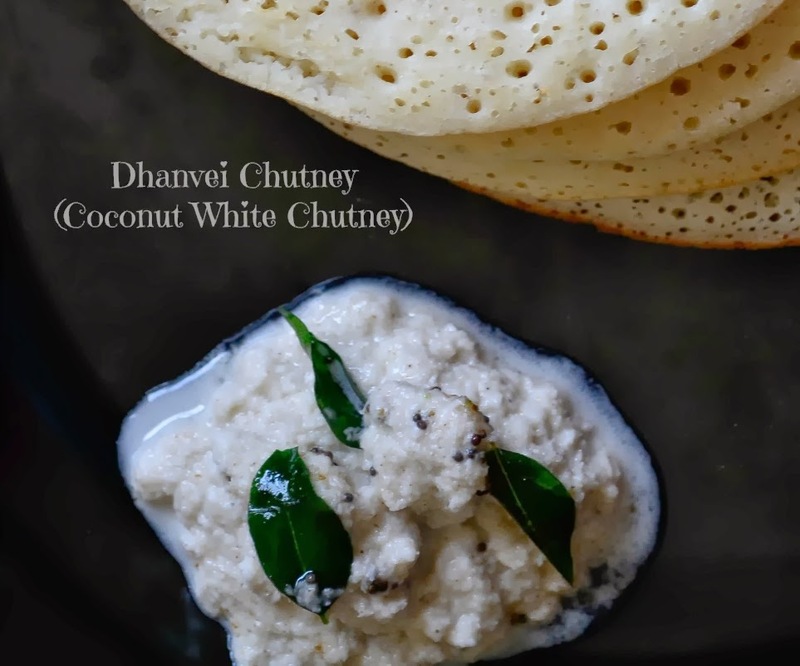 Serve it with coconut chutney or any other accompaniment of your choice. Grind all the ingredients using little water to a coarse paste. Add salt and season with mustard seeds, curry leaves and asafoetida. Enjoy these dosas with this chutney and cup of tea. this looks like a perfect breakfast. Lovely!